Flyers defenseman James de Haas (right) celebrates scoring a goal with Carsen Twarynski against the New York Islanders in Tuesday's preseason game. NEW YORK – Speedy winger Taylor Leier played in just 39 games as a rookie last season, barely played in the last two months, and finished with only one goal, making him sort of a forgotten man in the Flyers' training camp. 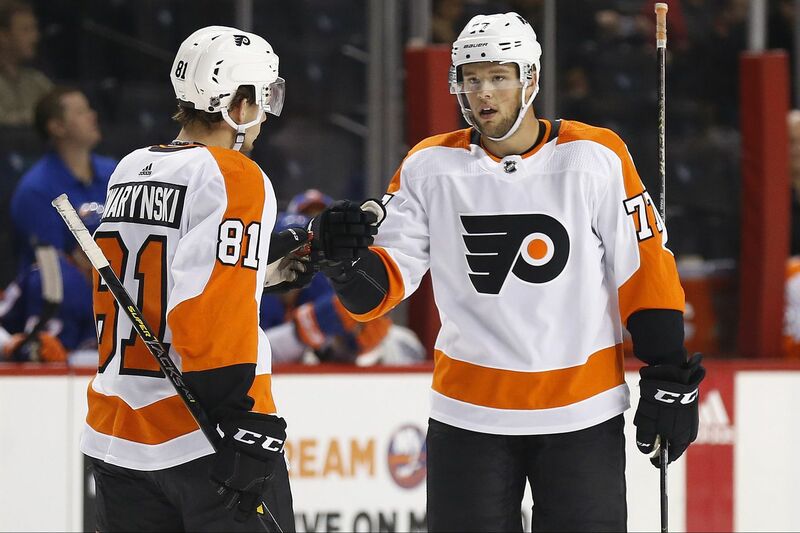 "Not from our standpoint," coach Dave Hakstol said before the Flyers' 5-1 preseason win Tuesday night over the New York Islanders at the Barclays Center. "Taylor's had a good camp, a solid camp." If Leier, 24, is going to earn a roster spot, he will probably need to show he can finish off his scoring chances and demonstrate his worth on the penalty kill. He was taken off the PK last year "because of some individual things and some collective team things," Hakstol said. "He's got to go out and play his role; he's in that third-, fourth-line type of role," Hakstol said. Leier played just three games over the last two months of the season. "That was the hardest thing – staying ready to play," said Leier, who had a third-period assist Tuesday and earlier blocked a shot and painfully fell to the ice while killing a penalty late in the second period. "I've never been in that situation before, where I played [so little]. That rhythm and the game legs that you get while you're playing consistently every second or third night, they aren't there. You're trying everything you can to keep them there by working in the gym and bag skating and trying to replicate game-like conditions in practice. But you can't really replicate it. I think it was more of a mental battle than a physical battle for me in the second half of last season. "At the same time, I'm trying to view it with a glass-half-full kind of attitude," Leier added. "Not many people can say they played in the NHL for a full season, and I'm super-proud of that, especially for this organization. I just want to help this team win. I want to bring a Cup to Philly. I want to be in the lineup every night with the guys because I think we have a special group here." Leier, who gained seven pounds over the summer and now weighs 184 – "with my body fat still the same" — said last year's benchings are behind him. "I think confidence and playing without fear are the keys for me to play at my best," he said. "My mind-set doesn't change, whether I played a full year like last year or was up and down like two years ago. Spots aren't guaranteed for anyone, and I'm excited for the challenge." Leier would have to clear waivers if the Flyers tried to send him to the AHL's Phantoms. "We have some tough decisions," general manager Ron Hextall said. Highly touted center Morgan Frost and left winger Isaac Ratcliffe were sent back to their respective Ontario Hockey League junior teams. Both played in just one exhibition game. Frost, who excelled in rookie camp and in the rookie game but struggled in his one NHL exhibition, will go to Sault Ste. Marie, and Ratcliffe to Guelph. Hextall said Frost needed to show more puck possession, create more space for himself, and demonstrate a little more maturity in his game. "It was pretty obvious, not only in his game but in practice, he wasn't ready for this," Hextall said. "Like I told him today, 'It's not a crime at 19.' "
The Flyers have 52 players left in training camp. Four players projected to be with the Phantoms — James de Haas, Carsen Twarynski, Phil Varone, and Danick Martel — scored goals in Tuesday's win. Jori Lehtera had the other goal. Goalie Alex Lyon, the scheduled starter, suffered a lower-body injury in warmups and was replaced by Anthony Stolarz, who stopped 31 of 32 shots. … Goalie Brian Elliott will make his preseason debut "in the next game or two," Hextall said. … Hextall on impressive 21-year-old center Mikhail Vorobyev: "He's hungry to make this team."